We are a leading Wholesale Trader of ion electrodes from Mumbai, India. Available with us is a wide range of Ion Electrodes like Ammonia, Bromide, Cyanide, Fluoride and Sodium P.O.R. 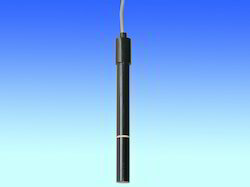 An ion electrode is also called a specific ion electrode, which is a sensor that converts the activity of a specific ion dissolved in a solution. This solution can be measured by a pH meter or a voltmeter. Looking for Ion Electrodes ?